Unmounting stamps has become a hot topic especially since Stampin' Up! is now selling unmounted red rubber stamps. I've been unmounting my wheels using EZ Mount cling foam. 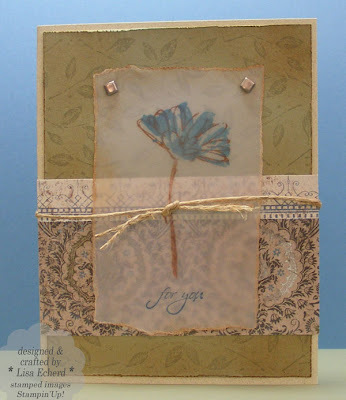 Stop by tomorrow for the step-by-step on how to turn wheels into regular stamps. This wheel makes a great backgound stamp when clinging to a grided block. 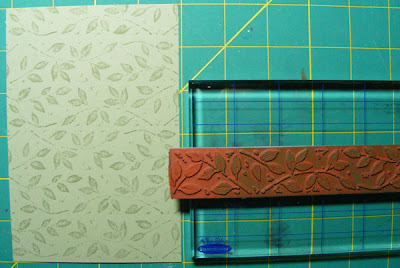 Just stamp row after row; then distress the edges for a pretty do-it-yourself designer paper. Ingredients: Stamps: Petal Prints and Leaf Prints wheel by Stampin' Up! Ink: Prussian Blue by Colorbox, Close to Cocoa by SU! ; Mellow Moss by SU!